EX1 Cosmetics has been all over the blogosphere recently, and I wanted to know more. EX1 Cosmetics Invisiwear Liquid Foundations (£12.50) are specially formulated for olive skin tones - hallelujah! Finally someone thought of the ladies with olive/yellow undertones! 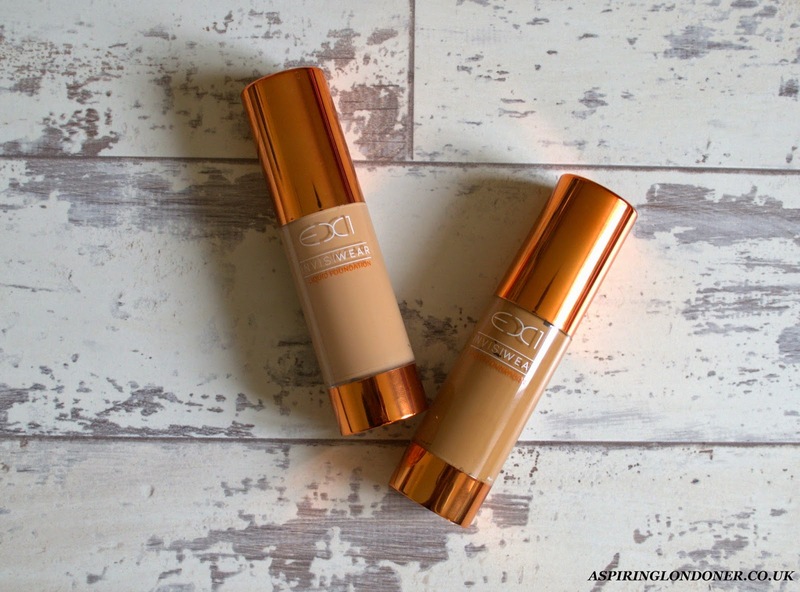 If you've read my blog long enough you'll know I pretty much always have to buy high end foundations as they're the only ones that do anywhere near my skin shade. Even then I'm restricted to Bobbi Brown, NARS etc to get a decent match. So this was music to my ears! The foundations are oil-free, fragrance free and liquid based. The packaging looks great, what I love about the packaging is that it's plastic so very light and makes it really easy to travel with. It has a pump too! The texture of the Invisiwear Liquid foundation is light yet creamy. One pump is enough for a medium coverage and you can build it up to a high coverage as the foundation blends so well. I love applying it with a brush and my fingers. Both results in a natural yet flawless finish. Think of the Illamasqua Skin Base foundation but lighter on the skin. There were so many times I touched my face without even thinking I had foundation on, and it didn't feel like I had foundation on either. I think the liquid base of the foundation really helps it to mesh with the skin and disappear. I have oily/combination skin and the creamy foundation didn't make my skin oily at all. When first applied it looked dewy, glowy and fresh and remained pretty much the same after 8 hours! It hadn't moved around on my face or turned into a greasy mess. The colour hadn't oxidised on my skin either. The Invisi Wear Liquid Foundation comes in five shades - F100, F200, F300, F400, F500. I have the shade F300 an F500, I blend the two together to get my perfect match. What's even great is that using these two shades, I can contour too. using the shade F500 darker shade to create shadows on the contours of my face and F300 the lighter shade to highlight. It works unbelievably well and looks really natural too! 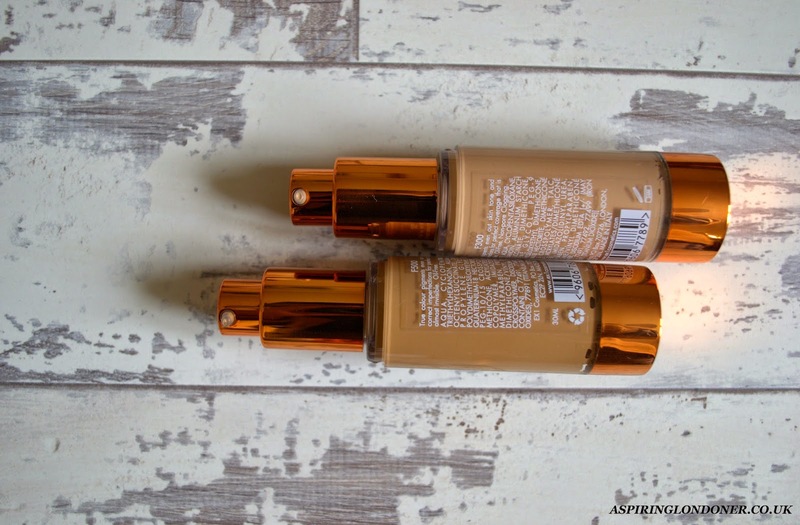 I'm just blown away by the Invisiwear Liquid Foundation! For a drugstore foundation price, to get something that I think is better than NARS Sheer Glow is quite amazing! Anybody with olive/yellow undertones (especially with asian/indian skin tones) to their skin really needs to try this out. I know the struggle of finding a budget foundation to work with your skin tones, and just really glad that someone has taken the initiative to bring affordable foundations to cater for asian/indian/olive skin toned people. Have you tried anything from EX1 Cosmetics? What is your go to foundation that matches your skin perfectly Share in the comments below or tweet me @aspiring_london!